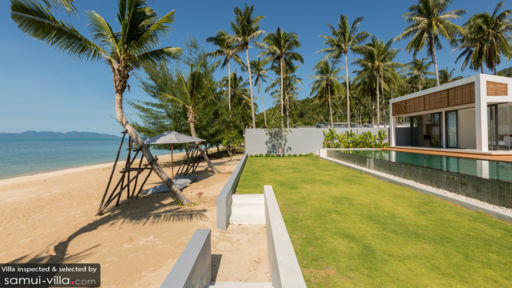 Along the tranquil shores of Laem Noi Beach lies the spectacular Villa Malouna. There’s plenty to see and do at this charming beach front retreat: take a quick swim from the beach to a gorgeous coral reef for a snorkelling trip, watch the fishermen at work during the scenic sunset, or simply lay back against one of the many comfortable daybeds to enjoy a sundowner or two. Six luxurious bedrooms are nestled away in three bedroom pavilions. 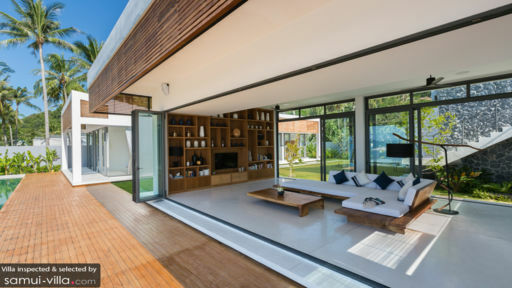 Two bedrooms are housed in the poolside pavilion, while another two are situated in the garden pavilion. The former overlooks the sparkling infinity pool and lagoon, while the latter offers views of the well-manicured garden. The remaining two bedrooms, set above the six-bed children’s dormitory, provide breathtaking vistas of the ocean. Step across the sleek wooden deck to make a splash in the spacious infinity pool. Your little ones will not miss out on the fun; a shallow area in the pool creates a child-friendly area for kids to frolic in the waters. When you’re done with taking a dip, dry off against a fluffy beach towel, and settle down snugly into the sunken pool lounge - the perfect spot for sipping cocktails while you catch the sunset. The communal living spaces at Villa Malouna are housed in two seafront pavilions. The first contains a stylish living area, while the second houses a striking dining area and open kitchen fully bedecked in black. Make the most out of the well-equipped kitchen by participating in cooking classes conducted by the expert in-house chef. The expansive dining area can comfortably accommodate twelve guests, but if an alfresco meal is what you’re after, opt for a garden picnic, romantic dinner by the beachfront, or a good ol’ barbecue by the poolside. Villa Malouna offers housekeeping services, airport transfers and a daily breakfast service. A baby cot is available for use free of charge. Personal chef services and kayak rental are available at additional cost. 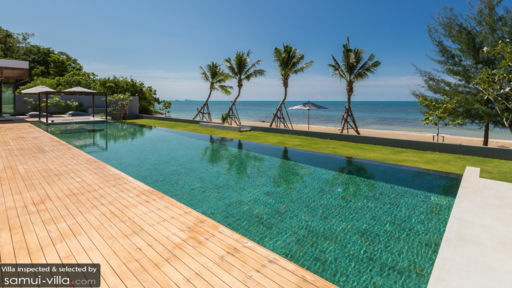 Villa Malouna is located in Bang Po, North Samui. Scenic, serene and with a lack of tourist crowds, Bang Po lends itself to families, couples and holidaymakers seeking a relaxing getaway. From the villa, you’re four minutes’ drive away from Bang Po Beach. You’ll find few beach-goers along the coast, so it’s ideal for quiet beach strolls accompanied by views out to Koh Phangan. Ban Tai Beach, located along the eastern end of Bang Po Beach is just as serene. You’re just a quick drive away to a wide-ranging array of restaurants, eateries and cafes. There’s Haad Bang Po, a venue that’s been named as the ‘best beach restaurant in the world’ by Travel + Leisure. Bang Po Seafood is another great option for mouthwatering seafood fare. Armando’s Beach Restaurant offers a peaceful waterfront setting, 4 Monkeys Coffee Bar features a funky setting, as well as excellent coffees and smoothies, while Khanom Jeen Pa Maitree is worth a stop for freshly made rice noodles with curry. There’s much to do in the northern region of Samui, whether you’re into yoga, spa treatments, cooking classes, watersports, cultural sightseeing or just want to hang out at the beach. We’d recommend drop-in yoga sessions at The Yogarden Samui, massages and spa treatments at the incredible Belmond Napasai, cooking classes at Island Organics and visiting iconic attractions like the Big Buddha Temple and Wat Plai Laem. We’re always happy to share more about Samai, so feel free to reach out to our travel consultants for further recommendations!